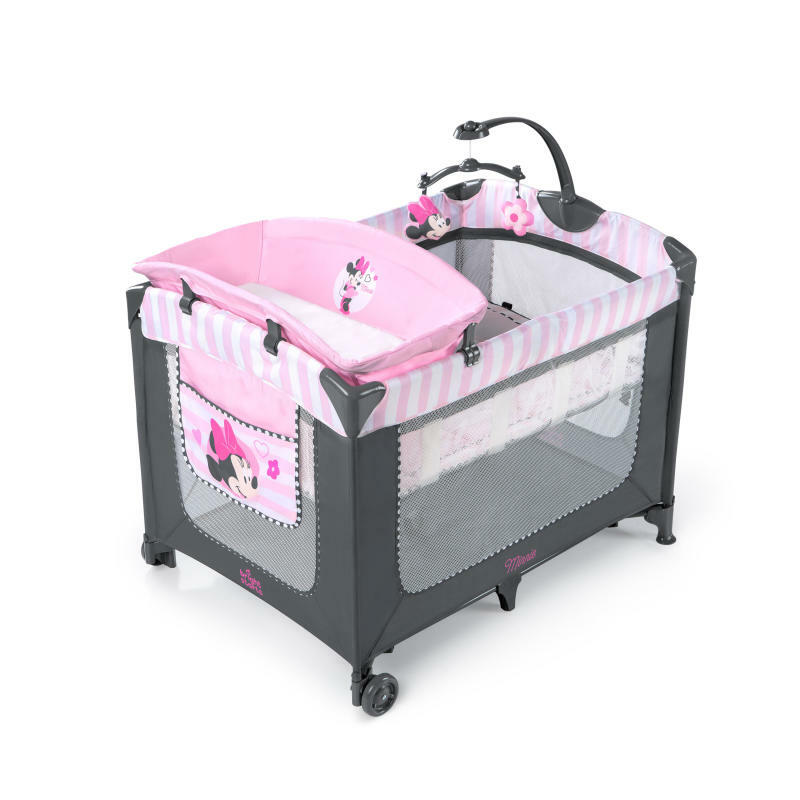 The Disney Baby™ Minnie Mouse Blushing Bows Playard™ from Bright Starts™ is every baby girl's dream come true. From the newest Minnie Mouse Blushing Bows™ Collection, this playard is designed with Minnie’s iconic fashion, and of course pink bows! The portable playard is loaded with features for baby and mom to take on the go to grandma’s house. Bright Starts™ added features that are within reach of mom. The Just Right Height™ elevated changing table makes diaper changes more comfortable for both mom and baby and a storage pocket keeps baby’s necessities at mom’s fingertips. The playard includes a comfy, perfectly pink bassinet for baby to take a nap on. When it’s time to play, simply remove the bassinet from the playard to add cushioning during playtime in the playard. The OneLessStep™ feature allows this playard to fold fast without removing the bassinet. To make transport easier on mom, the playard includes a travel bag. The playful mobile keeps baby entertained with 2 Minnie-approved plush toys. Complete your Disney Baby™ Minnie Mouse Blushing Bows™ collection with the Swing and Bouncer (each sold separately)!